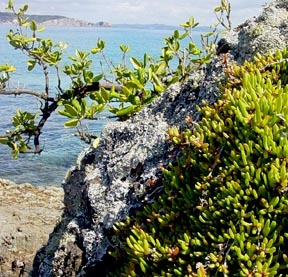 The objective was a trip to the restored island of Tiritiri Matangi, (37o 00.295S; 174o 954E; Elevation = 3') which lies in the Hauraki Gulf, about an hour's cruise east of Auckland City. 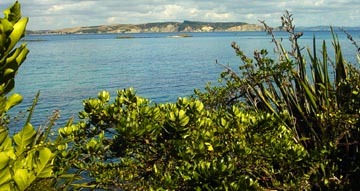 Tiritiri was an island devoted to the raising of sheep until approximately 30 years ago. Before that it had been a Maori place, with remains of at least two Pa's (Maori fortifications involved in intertribal warfare). Shell middens, like those of New England Wampanoags, are found here. and moved around the most recent volcanic island that dates to about 600 years ago -- Rangitoto Island--en route to Tiritiri Matangi. Viewed from all angles, Rangitoto is a most symmetrical island. The peak contains a shallow crater, and there are still caves in the lava flows. 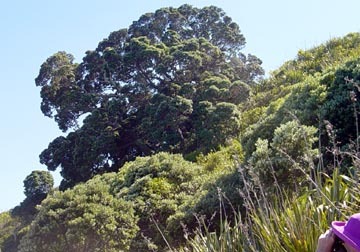 Its revegetation has been completed only in the last 25 years or so, and features the "New Zealand Christmas Tree"--Pohutukawa. After passing Rangitoto we encountered numerous sea birds, including a huge flock of Fluttering Shearwaters, with many Gannets, and a few Blue Penguins. 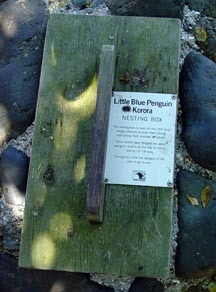 Blue Penguins are the smallest species of penguins, and breed throughout much of New Zealand. Unlike colonial penguins like Adelie's and Gentoos, Blue Penguins move into wooded regions as single pairs, and nest in underground cavities, being quite secretive. When the boat reached Tiritiri, our group of about 13 intrepid explorers followed our volunteer leader, Gerhard, for a walk through the dense reestablished forest and over a very steeply dissected island that topped out at about 300 feet above seal level. The group included folks from California, Australia, New Zealand, Sweden, and The Netherlands. 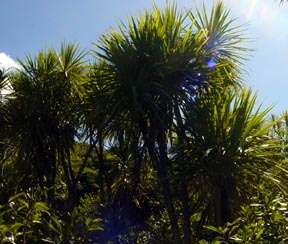 Gerhard was an expert naturalist and pointed out the dominant vegetation, including Cabbage Trees, New Zealand Flax, and the ever present Pohutukawa trees. The Pohutukawa is called the New Zealand Christmas Tree for its red flowers that open in December. New Zealand Flax is the spiky plant on the right, it grows throughout New Zealand, with leaves as tall as 6 or 8 feet. It was formerly harvested and the fibers in the leaves used for twine and cordage. 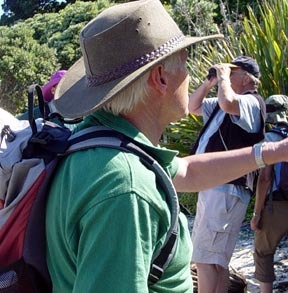 Tiritiri Matangi is maintained by the New Zealand Department of Conservation, which has, with significant volunteer help, restored the island to a semblance of its former pristine shape. Much research goes on here, including the maintenance of nesting sites for Blue Penguins that allows continual monitoring of their nesting success. The wooden lid over the top of the subterranean nest can be lifted to observe the young. The incubating parents exchange roles only at night. I found the shore near the Penguin sites to be interesting for the presence of succulents and lichens encrusting boulders in the intertidal zone. Something you would never see in New England. These lichens must be very salt tolerant! 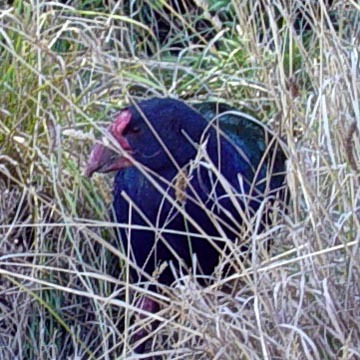 Along the beach we encountered our first Takahe. 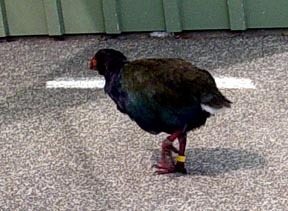 This large flightless bird weighs up to about 7 or 8 pounds, and is related to the coots or mud hens. Fully terrestrial, it was threatened with extinction only a few years ago. 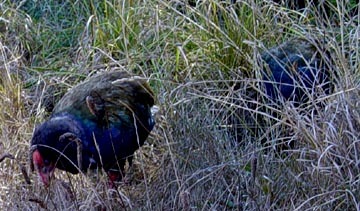 A relict population in the extreme southern part of the Fijordland district of New Zealand provided a nucleus for the birds that are now found on Tiritiri. After building up to a population of about 30 birds on Tirtiri, the present number has declined to 18 at present. Apparently in denser populations (30 was dense), the aggressive males kill subordinate males. The birds are very tame and approach visitors, eagerly looking for handouts (not encouraged). Some of the Pohutukawa trees on the island are large and substantial trees, with the oldest having been dated to 800 or 1000 years old. They are impressive, and must be doubly so when in bloom. Among the many rare and unique birds seen on our trip were Tui's (on the left and right pictures below), and the Bell Bird (on the right of the left picture). 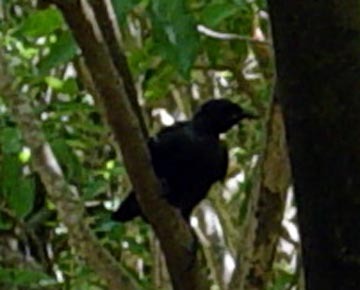 The male Tui is a grackle size bird with iridescent purple plumage, and a distinctive tuft of white feathers at the throat.  The Bell Bird, which is very abundant here has a very musical and loud call that is as pleasant as any bird's can be. Other spectacular birds that we saw included Saddlebacks, New Zealand Kingfisher, Stitch Bird, Fan Tail, Whiteheads, Red Crowned Parakeet,and the New Zealand Robin. Not at all related to our native Robin, this little black bird is exceptionally tame, and owes its name to its calls that do resemble those of our robin. While we didn't see the normally nocturnal Tuatara (Rhyncocephalian reptile) or Spotted Kiwi, it was an extraordinary birding trip that I probably will never see the likes of again. It was a wonderful day.